With its name painted in bright red on four rough steel plates, carpentry workshop Chingchun Warehouse fits in well among the cluster of grungy garages and car repair shops in To Kwa Wan’s 13 Street area. After the sun has set on Fung Yi Street and all of the other shops have rolled their gates down, a yellow light illuminates the little workshop and 82-year-old carpenter Master Lung Chun begins his lesson inside. 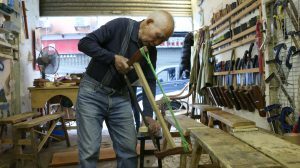 Yan Yung, 30, one of the co-founders of Chingchun Warehouse, met the veteran carpenter in To Kwa Wan after she came back to Hong Kong from a one-month carpentry course in Taiwan. 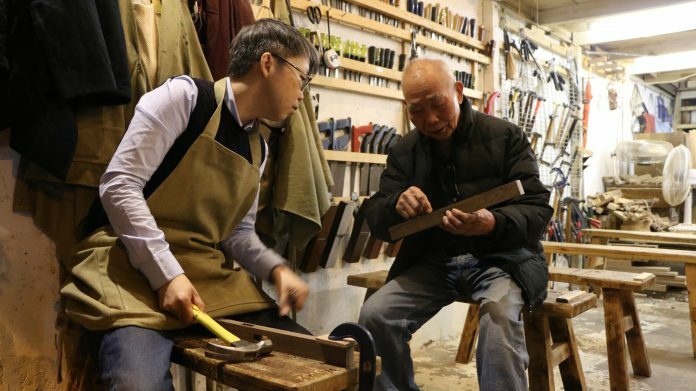 Their enthusiasm for the craft brought them together and they started Chingchun Warehouse in 2014 to promote the joys of carpentry. They first established their workshop in an industrial building in the area, but they were forced to leave because neighbours complained about the noise they made when wedging and ramming. In the end, they found their home on 13 Street. Yung hopes to interact with their community through carpentry, and has made stools to give away to their neighbours and people living in the area. 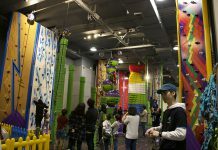 Chingchun Warehouse offers both short-term and long-term courses, and charge around HK$200 for each three-hour session. In the short-term course, which consists of four sessions, students are taught how to make a wooden bench. The classes are usually held on Saturday afternoons or Monday evenings. The long-term courses provide a more in-depth knowledge of carpentry. First, you will learn the proper usage of different tools. Then, you will learn basic carpentry skills such as tenoning, which is a way to make joints without the use of nails. Students can also work on their own projects, like toolboxes. Usually, a long-term course has 12 sessions. How to make other items, such as tables and wooden toys, can also be taught on request. Carpentry takes a lot of time and patience, but that’s the point. “We hope to see our students enjoying the whole process and relaxing instead of rushing to come up with the final product,” says Yung. While it can be fun, Yung warns that carpentry is also physically demanding. 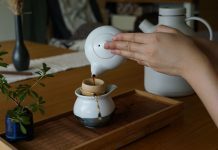 Instead of treating it as any other hobby, Yung says potential students need to be persistent in order to make progress. For more details, search 青春工藝 chingchun warehouse on Facebook.